A perfect shore vacation; A Craftsman home in the historic town of Asbury Park, NJ, Perfectly located on a quiet street across from Deal Lake. Property is surrounded by privet hedge and privacy fence. A beautifully designed, furnished and extremely comfortable home with living room, dinning room, sun room, screened in porch, 5 bedrooms, 2.5 baths, and outdoor shower. A fully equiped outdoor with gas grill, large dinning table and pool with 6 lounge chairs. So many new restaurants and shops all along the boardwalk and downtown. Our story is a simple one. We were a group of 3 friends who fell in love with this honky tonk Asbury Park town 20 years ago. At the time there was nothing open on the boardwalk, nothing open downtown on Cookman, but many friends enjoying the beach, backyard parties, and supporting a town to become the creative unique destination it is today. My home is the kind of place you have a hard time leaving.... Its the perfect city get away to bring friends to relax. I love the privacy of the property location, relaxing by the pool, take bikes out to explore the boardwalk and the other NJ beach towns. Bathroom 1 has a tub/ shower; Bedroom 2 has a steam shower; There is also an outdoor shower with hot and cold water. (2) There is a washer and 2 dryers available. Never have to wait for the dryer, you can keep washing and finish in record time. Hidden 50" flatscreen TV, couch, two club chairs, wood burning fireplace. 20 Piece Place settings, China and outdoor plastic. Expandabale Dining Table- 2 additional leaves- could fit up to 20. 50 inch flatscreen TV. DVD player and Apple TV wifi. Apple TV, You can use your Itunes or Netflix accounts. Large teak outdoor dining table that accommodates 10-14. 16' x 35' pool with gradual slope from 3 feet to 7 feet. Three stairs stretch 16' foot wide, the length of the pool at the 3ft level. Well stocked house, nicely appointed, great pool! I love this home. It is quiet and private within this gated yard and house. The pool is inviting and it is so comfortable lying around the pool, listening to music, reading, and chatting with friends and family. i love sitting on the screened in porch having coffee in the morning and also as the sun sets. Bikes were provided for riding around the town. The beach, boardwalk, shops and restaurants are wonderful. What a beautiful home. The house is spacious and well-appointed yet warm and inviting throughout. The owner(s) clearly have an eye for interior design. 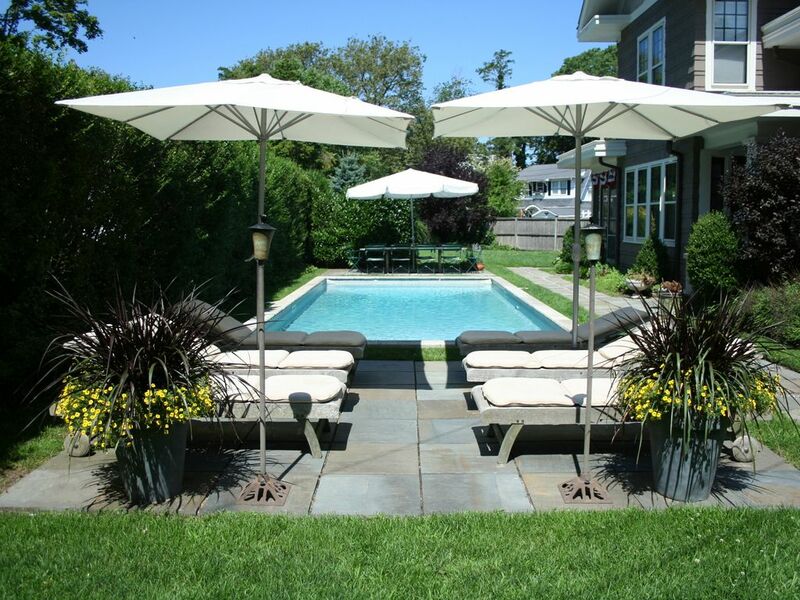 We spent much of our time in the pool and yard area, which is beautifully manicured and quite private. It was perfect for grilling and eating al fresco. The house is a quick five-minute bike ride to the boardwalk and beaches (bikes provided). I don't think we could have picked a better home base for exploring Asbury Park. We stayed in this home for a week in the summer of 2014. The home itself is wonderful. Once you arrive and close the high gates behind you, it's a big slice of heaven. However, once you leave the gated property, you are in a whole different world. Lets just say, you probably won't be going for an after dinner stroll in the neighborhood. Additionally, getting our deposit back took about a month. We fell in love with this house!! We didn't want to leave the property all week. It's so well appointed with furnishings, utensils, linens, etc. It has so many charming nooks and crannies. It's huge. The outdoor area is spectacular. The pool is very large with plenty of room and outdoor dining. There are 2 large grills. Asbury Park itself is a lot of fun and the beach is close and easy to get to from the house. We are definitely going back and renting this house. Can't say enough great things about this house. Fluffly white linens, big comfortable couches, amazing pool, completely equipped garage (with bicycles, rafts for the pool, etc.) and a kitchen/pantry that seems like it was outfitted by Martha Stewart. Feels homey...but without all the clutter. Highly recommend it. Fantastic food, eclectic boutiques, family fun, colorful nightlife and one of the best live music scenes in the world are just some of the things we’ve got going on—all tucked neatly along a historic beachfront promenade splashed with vibrant murals. So no matter who you are, where you’re coming from, or what you’re into, there’s something for everyone at the Asbury Park Boardwalk.